Serpent/CHICCHAN is another kind of “Dragon” as a Snake… a symbol of Life Force that holds a Gift of Consciousness. The Snake has an extraordinary sense of Vibration. It doesn’t see the presence of its prey, it feels it through Mother Earth. CHICCHAN is the Sense to FEEL the dragon energy of the ley lines. We saw the Dragon in the Seed as the imperishable evidence of Human’s Divinity. 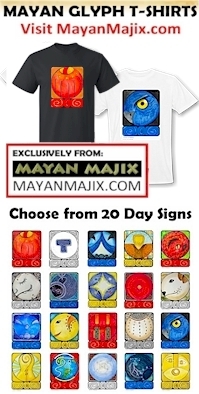 Again, a Dragon is giving us the “eyes to see everything clearly.” CHICCHAN is a symbol of the Feathered Serpent, Kulkulkan/Quetzalcoatl, the Light from Above that travels down the pyramid stairs at Chichen Itza – the Calendar pyramid. The Light marks a mid-point between Dark and Light. Human eyes SEE. Spiritual eyes FEEL. Brought to Focus in the Center, they are the Divine Eye that KNOWS. Could the Maya’s crossing of children’s eyes have started out as an Intention for one to have the clearest vision in their Dreams? The Tzolk’in calendar… one thought always leads to another that makes sense through a Meaning and Purpose – reasons. The Reasons we do things creates our Truth. Tone 12 is a day of Understanding. The energy of Number 12 relates to Comprehension and Communication, as a Truth Spoken to the Heart. Tone 12 elevates “Knowing” from something we “think” to something we can “feel” is True. We were offered a clarifying description of the Number 11 from a K’iche Daykeeper in Guatemala. We associate Number 11 as a Resolution for Higher Discernment that brings clarity. I like the K’iche way of saying it better. Jen’s teacher taught her it was an Antennae that tunes us in for a Divine Discernment. We might see something deeper in 12, as the “12 Below” – like the 12 Constellations around the Higher “13” of the Sun, or 12 Disciples led by the “13” Ascending One. The Reed/BEN trecena has been all about the Light of Home and Family. This was the Divine Intention for this New Understanding. We found the Wisdom in Seeing Each Other, and how Valuable the Gifts that Anyone and Everyone could Offer. Seed/KAN is also a Symbol of Family as the Divine Genetics of our Family Tree. KAN specifically relates to the Center of the Seed, the Forces of Life and Spirit that are imperishable lying within the Seed. Humanity is a Seed that holds its integrity. No matter how long it lies dormant, it’s ALWAYS READY, perfectly prepared for it’s first moment of Life. We are the Seed of a Divine Dream.